Cardiff playground receives Tesco funding allowing kids to enjoy outdoor learning. A Cardiff school’s playground has been transformed thanks to a grant from Tesco’s Bags of Help initiative. Coryton Primary School received £4,000 from the supermarket’s flagship community grant scheme – which is funded by sales of carrier bags. The money has been used to install a shelter in the playground which protects children from the elements during their playtimes. It also means the children are now able to enjoy lessons outside under the shelter, offering respite, come rain or shine, for 200 pupils at the school. 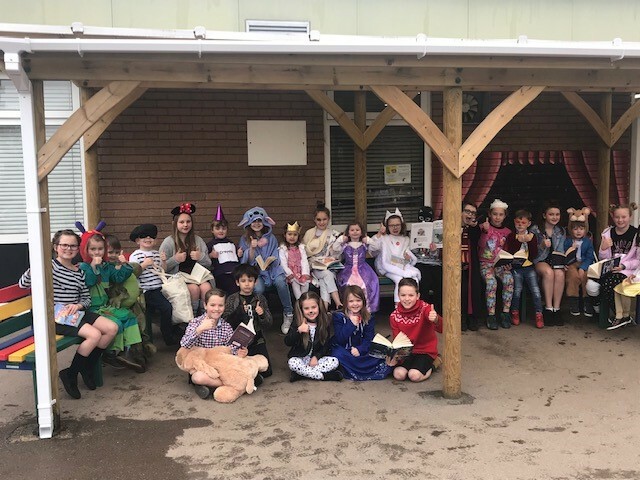 The shelter was put to good use this month, with the kids enjoying the outdoors to show off their World Book Day costumes. The shelter was planned and constructed by parents with children at the school who volunteered their time and expertise to help the plan come to fruition. One volunteer, PTA member Amy Rowlands, said: “Without Tesco Bag of Help, we would not have been able to complete this project. The children will be able to use the shelter every school day, enabling them to enjoy much more outdoor learning and play time. Rhodri Evans, Local Communications Manager at Tesco in Wales, said: “Bags of Help continues to be a great success. “To have awarded this amount of money to thousands of groups all over the UK is a fantastic achievement – and it’s all down to our customers. Since launching in 2015, Bags of Help has awarded more than £56 million to more than 16,000 projects all over the UK. Customers are able to vote for a Bags of Help project in store using a blue token given to them at the check-out. At the end of voting period, votes are collected and three groups in each of Tesco’s regions will be awarded funding. Funding from £1,000 to £4,000 is now available. For more information visit www.tesco.com/bagsofhelp or pop into your local Tesco and talk to your local community champion.